So, the interior ministry has pulled yet another stunt with Additional Director of the Federal Investigation Agency (FIA), Zafar Qureshi. We can now officially say that the Pakistan Muslim League-Quaid (PML-Q) has started reaping the benefits of joining the Pakistan Peoples Party (PPP) led government coalition. 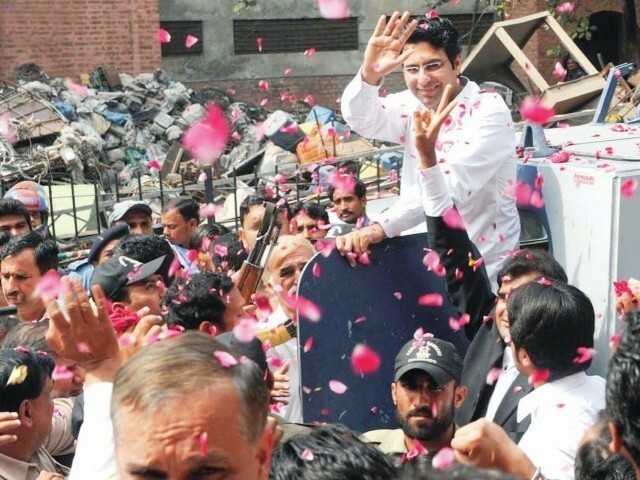 Moonis Elahi must feel relieved. His party is now aligned with the professionals and he can be sure of the fact that the corruption charges levelled against him will probably not translate into a conviction. As usual, cleansing Elahi’s image has required sacrifice from those who believe in principles. Qureshi, the lead investigator of the case has found himself in the doghouse yet again, after he allegedly refused to sit back quietly till the charges on Moonis’s involvement in the NICL scam are discredited. Qureshi has been in the line of fire ever since he linked the scam to Junior Elahi and actually dared to take him into custody for further investigation. Poor, delusional Qureshi, actually thinking that he could hold a potential candidate for prime minister accountable! The PML-Q is not about to let the future prospects of dear old Moonis be tarnished by an actual conviction. Mr Qureshi should have known that his record breaking recovery of Rs1.75 billion in the NICL scam does not matter when it comes to our ruling elite. A typical Pakistani politics drama ensued. The lead investigator was suddenly transferred to the National Police Department before the investigation finished. The Supreme Court, continuing its bid to go after all powerhouses, stepped in to ensure that he was reinstated at his position. Again, in another dramatic twist, court orders were immediately neutered by the transfer of four key members of Qureshi’s team to different provinces. The second suspension came in the wake of his application to restore these four FIA officials. There hasn’t been anything subtle about the way this case is being handled – no delicate clues, no delicate hints to back off. The government seems to be devoid of any fear of persecution, and has continued to disrupt the investigation on each and every level. As is the norm now, the Supreme Court has stepped in yet again and has summoned the Attorney General to present a complete record of the suspension. But, as the court battles it out with the bureaucracy, the government continues its blatant efforts to skew the investigation. The case has taken more dramatic turns as key witnesses have changed stories and have even denied ever giving a statement to FIA. This case is fast becoming a perfect example of how justice is ‘managed’ in Pakistan’s political circles. Sadly, there is nothing new in this whole scenario. Just new characters playing out the same old story that rules the way Pakistani politics is played. But maybe we should look for the silver lining. Who says Pakistan doesn’t have opportunities? The only thing you need is to be associated with the right people at the right time. So, forget principles and forget merit. Don’t worry about making a fortune in a legal manner. Join a party, link yourself with the rich and the powerful, and your fortune, no matter how you’ve made it would be legalised – for that is the way of Pakistan. Mukarram Khan, Saleem Shahzad...who's next? Gutsy Marvi steps down...goes solo? Do parliamentarians care about the education emergency? The things are not that simple, as the learned writer wants to believe. Honourable Supreme Court is not that going after powerhouses in Pakistan. It seems selective where to go and where not to go. I would request the learned writer to have a glance backward in the last a year or so to arrive at an appropriate conclusion. Having no love lost for Chaudhries or Moonis Elahi or PPP, allow me to say in principle that separation of Executive & Judiciary is compromised if the judiciary wants a particular case to be investigated by particular investigating officer(s). In such a situation, the accused may question the credibility of whole process and may say, “Judge desired to punish me anyway; that is why he got my case investigated by an officer of his choice”. So when prosecutor and court join hands, there is no possibility of justice to accused. Apart from that, no public servant is supposed to impose her/himself upon her/his bosses or assume him/herself indispensible, no matter how outstanding he/she may be. So the things surrounding the Add DG FIA (now said to be under suspension) show that Mr Qureshi should have remained within parameters of official decorum & discipline. However, without going into a macro issue (judiciary etc) – we can pretty much ascertain that Moonis is looking very guilty – and even though this may be a selected case – why can we not bring him to justice and make him pay? How much longer do our people have to suffer this crap? Why can’t we make an example of this kid, who has no regard or respect for our laws or country? Lucifer has reserved jobs for Pakistani legal charlatans to assist those ‘innocent’ mortals who are scared to death; after their compulsory expulsion from this planet, to be pushed into hell. Yes I agree with Sadaf, the present Govt is putting all its efforts and energies to save Monis Elahi,if they would have put its energies and efforts to resolve issues like load shedding, inflation and law and order then things would have a lot better than present..may Allah save Pakistan from these hypocrites. It should have not been difficult for you to start a business after getting some proper education and having good bank balance, Moonis. You should have taken it as a challenge to bring about a new business in Pakistan which could help Pakistan as well as your own economy but you preferred to loot the money of people of Pakistan. that some witnesses had stated during the investigation that a portion of sale proceed transferred in the bank account of a co accused which actually meant for Moonis Elahi .